Combined with its wide f/1.2 maximum aperture, the focal length makes it a very versatile all-round prime for low-light photography, portraiture, general use, and creative out-of-focus background bokeh effects. Optical construction utilizes 19 lens elements in 14 groups, including 1 super ED (extra-low dispersion), 2 ED, 3 HR (high refractive), 1E-HR (extra-high refractive), and 1 aspherical, and all with Z-Nano Coating to help reduce flare and ghosting. The lens’s internal focusing system guards against protruding elements during focusing, and autofocus is driven by Olympus’s MSC high-speed autofocus motor. The Olympus 25mm f/1.2 also features a MF focus clutch system for quickly disengaging the autofocus motor and switching to manual focus when desired. The lens barrel is weather-sealed for splash and dust protection, as well as for operation in sub-zero temperatures down to –10ºC (14ºF). The lens barrel is 87mm long, weighs 410g, features a 62mm filter thread, and comes supplied with a bowl-shaped lens hood. The Olympus 25mm f/1.2’s super-fast maximum f/1.2 aperture and excellent light transmission of 1.8 TStop helped it achieve an overall DxOmark score of 26 points, thanks to its good low-light performance. This score ranks just behind the alternative $598 Panasonic Leica Summilux DG 25mm f/1.4 with 27 points. The Olympus 25mm f/1.2 boasts improved scores for sharpness and distortion compared to the Panasonic alternative, however, as well as the slightly wider maximum aperture that lets through more light. The lens achieves peak sharpness of around 70% acutance in the field at f/4 and f/5.6, with close to uniform resolution into the corners at these settings. At the widest f/1.2 aperture, resolution is a little lower at around 60% acutance in the center, dropping a little to around 55% in the corners of the frame. Between f/1.8 and f/2.8, it achieves excellent center sharpness around 70% acutance, and although resolution isn’t truly uniform at these settings, the edges improve as you close down. Resolution at the narrower apertures is best at f/8 with around 65% acutance, dropping below 60% at f/11, and down to around 50% at f/16. It has only very minor barrel distortion of 0.2%, which isn’t significant, so you can expect reasonably straight lines without any post-production correction. The heaviest vignetting of –1.2 EV occurs at the lens’s maximum aperture as you’d expect, but it’s well-controlled even at this setting; and although a tiny bit of corner shading around -0.33 EV remains between f/2.8 and f/16, it’s restricted to the far corners, so has only limited impact on your images. The Olympus 25mm f/1.2’s chromatic aberration score of 15µm indicates that some noticeable fringing is evident at some settings, particularly between f/1.2 and f/2.8 in the outer field, but with improved (if not perfect) performance at the narrower apertures. 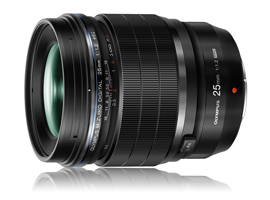 As both Olympus and Panasonic MFT-mount lenses are compatible, there are plenty of lens options in the 25mm standard prime focal length category for MFT shooters. We haven’t tested anything as fast as the Olympus 25mm f/1.2, but both the $598 Panasonic Leica Summilux DG 25mm f/1.4 (Panasonic 25mm f/1.4) and the $248 Panasonic LUMIX G 25mm f/1.7 (Panasonic 25mm f/1.7) offer wide maximum apertures and good light transmission. 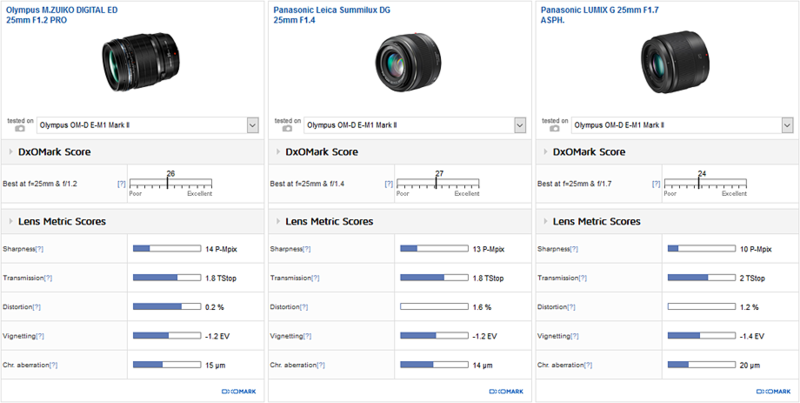 In fact, the Panasonic 25mm f/1.4 scores the same 1.8 TStop for transmission as the Olympus 25mm f/1.2 and ranks just ahead of it for low-light performance with a DxOMark Score of 27 points (compared to 26 for the Olympus). With a transmission score of 2 TStop, the Panasonic 25mm f/1.7 isn’t far behind for low-light performance as well, scoring 24 points overall, but it can’t quite match the more expensive options for sharpness. Using their respective maximum apertures, the Panasonic lenses are fractionally sharper in the center of the frame, but with more pronounced drop-off compared to the Olympus lens at f/1.2. By f/2, however, the more expensive primes produce high levels of resolution over a larger central area of the frame, and with slightly better corners compared to the more budget-friendly Panasonic 25mm f/1.7. Both the Olympus 25mm f/1.2 and the Panasonic 25mm f/1.4 offer excellent and very close to uniform resolution at all settings between f/2.8 and f/8, and although the cheaper Panasonic 25mm f/1.7 isn’t bad at these apertures either, it never quite hits the high 70% acutance of its competitors. The Olympus 25mm f/1.2 distorts significantly less than the Panasonic options, however, which display some noticeable barrel curvature. Although the distortion can be easily corrected in post-production using lens profiles, the correction results in a slightly smaller image (since the dead space is cropped out), so it’s preferable not to correct if possible. All three MFT 25mm primes display similar levels of corner shading at their respective maximum apertures, but both the Olympus 25mm f/1.2 and the Panasonic 25mm f/1.4 recover quicker, with minimal vignetting evident at f/2, compared to the Panasonic 25mm f/1.7. All three are virtually free from corner shading at f/2.8 or smaller. Although the headline scores for chromatic aberration look similar across the three lenses, fringing on the Panasonic primes is restricted to the far corners, compared to the Olympus lens, where the effect can be seen in a larger part of the outer field, and as such will have more impact on your images. The Panasonic 25mm f/1.7 does display the heaviest fringing overall, but again, only in the far corners. The field map profile below of results at the lenses’ respective maximum apertures is fairly indicative of their performance throughout the aperture range. At $1199, the Olympus 25mm f/1.2 is not cheap, but you get a lot of lens for your money, with weather-sealed barrel construction, advanced optical construction, and a super-wide f/1.2 maximum aperture. Its excellent light transmission ranks it as one of the highest-scoring MFT-mount lenses we’ve tested on the E-M1 II, only fractionally behind the Panasonic 25mm f/1.4. It achieves a slightly higher overall sharpness score compared to the Panasonic alternative, however, and significantly less geometric distortion, which could be important if you want straight lines not requiring correction in post-production. Performance at the maximum f/1.2 aperture is good, but closing down to f/2 notably improves center resolution and reduces vignetting. For peak performance, consider shooting at f/4 or f/5.6 on the Olympus 25mm f/1.2. For greater insight into the performance of alternatives to the Olympus 25mm f/1.2, please see our Olympus OM-D E-M1 II best prime lenses review, as well as the Sigma 30mm f/1.4 DC DN C, Panasonic LUMIX G 25mm f/1.7 ASPH and Panasonic 25mm LUMIX G 25mm f/1.4 individual lens reviews.